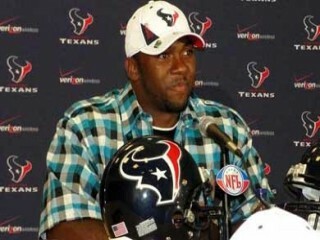 Earl Mitchell is an American football defensive tackle for the Houston Texans of the National Football League. Selected by the Houston Texans in the third round (81st overall) of the 2010 NFL Draft...Signed by Texans on June 10, 2010. Played in 49 games with 37 starts for Arizona, starting 12 of 24 games at tight end/H-back, and all 25 games at defensive tackle…on defense, he recorded 88 tackles (50 solos) with eight sacks for minus 42 yards, 18 stops for losses totaling 60 yards and one quarterback pressure…also caused one fumble, deflected two passes, and blocked one punt…on offense, he caught 14 passes for 174 yards (12.43 avg) and two touchdowns…added seven yards on four carries (1.75 ypc), and returned on kickoff for eight yards. All-Pacific 10 Conference second-team selection by the league’s coaches…named to the preseason watch list for the Lombardi Award…the defensive co-captain started 12 games and led Arizona defensive linemen with 48 tackles (34 solos), as he ranked seventh in the Pac-10 and 60th in the nation with an average of 1.04 tackles for loss per game, totaling 12.5 stops for minus-46 yards…made 6.5 sacks for losses of 32 yards…collected one pressure, one forced fumble, and one pass deflection…earned Pac-10 Defensive Player of the Week honors vs. Southern California. Shifted to the defensive side of the ball, starting all 13 games at left defensive tackle…put on 30 pounds in strength training to support the move to defense…finished with 40 tackles (16 solos), 1.5 sacks for minus-10 yards, 5.5 stops for losses of 14 yards and a pass deflection. Played in 12 games at fullback and H-Back…caught five passes for 38 yards (7.6 ypc) and a TD, adding an eight-yard kick return vs. UCLA…scored the team’s first TD from its new spread formation when he caught a seven-yard toss at the end of the Brigham Young clash. The 250-pound fullback started seven games while seeing action in all 12 games as a true freshman…rushed four times for seven yards and caught nine passes for 136 yards (15.1 ypc)…blocked a punt vs. LSU, adding two catches for 26 yards…had a 27-yard reception vs. Washington State and two grabs for 45 yards and a score in a 37-10 triumph over Oregon. Attended North Shore (Galena Park, Tex.) High School…earned first-team All-District 23-5A honors, as well as SuperPrep All-Midlands and All-Southwest…as a senior, helped his team to an 11-1 record, with their only loss coming in the area playoffs…rated the ninth-best tight end by Texas High School Football…listed as a Houston Chronicle Top 5 area receivers recruit, one of Dave Campbell’s Texas Football Top 10 tight ends, and a Dallas Morning News State 100 selection…ranked 82nd on the San Antonio Express-News Texas 100 and named an area top prospect by Port Arthur News…earned postseason Texas 100 honors from Rivals.com, as that recruiting service gave him a three-star rating and listed him as the nation’s 10th-best fullback prospect and the 93rd-best prospect from the state of Texas…Scout.com gave him a three-star rating and listed him as the nation’s 29th-best tight end prospect. PERSONAL: Interdisciplinary studies major…resides in Houston, Texas.